Sanwa Growers Inc. was founded in 1981 by Tony Leung, a native of Hong Kong and a graduate of Guelph University in Ontario. 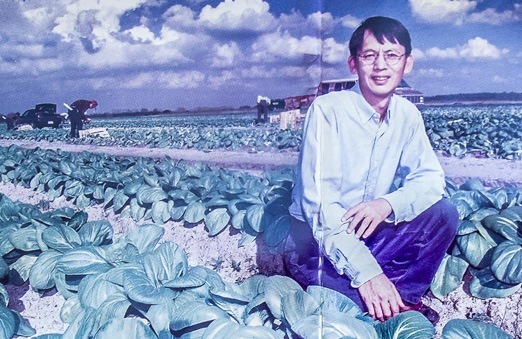 After starting to farm and market produce in Canada, Tony came to Florida in 1980 to find winter growing areas for his specialty Asian produce. He stopped to visit a former professor in Ruskin . . . and stayed for 20 years! Tony began farming on 160 acres of leased land in south Hillsborough County in 1981. After traveling back and forth for a few years, he settled here. His wife Connie, also a Hong Kong native and Guelph graduate, joined him as CFO to the newly-formed Sanwa Growers Inc. The company started as an agricultural concern, growing and harvesting Chinese cabbages and melons. In 1982, Sanwa had 5 full-time employees and 50 full-time employees in 1992. By 2001 Sanwa employed 180 full-time employees. At the end of 2002, Sanwa's employees numbered 230. Tony saw the wisdom of vertical integration, from both economic and marketing standpoints, and moved toward that goal steadily. Connie worked at obtaining sources for financing and negotiated rates and terms. The farm in Canada was still being operated by a partner, and much of the product from Florida was used to supply their Canadian customers during the winter months. As the farm acreage grew, the Leungs approached the chain stores with their product. By 1992, Sanwa had opened their own nursery to grow starter plants. As a way to keep employees busy year-round, herbs were grown to fill in the slow months. That product line eventually became a high-volume sales item. A fleet of delivery vehicles was built, assuring better control of temperatures through distribution, and therefore better quality product. A recently purchased packinghouse was doubled in size. Distribution centers were opened in Miami and Atlanta. Over the past 10 years, the company has seen tremendous growth. The "niche" market they catered to 20 years ago has expanded and spread to the mainstream. Tony now spends much of his time checking the markets and making purchases from growers and business associates worldwide. In addition to their own product from Sanwa Specialty Herbs brands, Sanwa now represents many other household names to the Tampa, Atlanta and Miami food service markets. The Tampa location, Sanwa International Wholesale Foods LLC, is a full-service supplier to restaurants from Fort Myers to Gainesville, including the entire Tampa Bay area. Specializing in ethnic products to complement the demographics of our area, this location is a unique place which services small wholesale markets, restaurants, delis, and even large families who want to shop wholesale without club fees. Sanwa's newest distribution center is located in the Sanford State Farmers Market, just north of Orlando. This historic market is being restored to its former glory via a joint effort by Sanwa International Foods and the Florida Department of Agriculture and Consumer Services. The Sanford center is servicing the Orlando area and the east coast of the state. Corporate Office: Sanwa Growers, Inc.